Wind, wind and more wind-will it ever cease?! A couple of un-birdable days as persistent 50mph easterlies battered the Island once more. An attempt was made on 27th but just a single European White-fronted Goose and 4 Whooper Swans were on offer. Full-time Ornithological staff will be off-Island now until the third week of February, but details of casual sightings until then will appear on our Facebook page. So click on the link on the right hand side to keep in touch of any latest news. More wind and rain on the 24th with the former building to gale force 10 overnight. The drake Green-winged Teal was seen on both bates and after the storms an adult Little Gull dropped into the airfield briefly on a more pleasant 25th. The 3 Tundra Bean Geese were also still present, along with 3 White-fronted Geese (2 European and the lingering Greenland). The juvenile Iceland Gull was seen again at the north end with 25 Snow Buntings nearby at Bewan. A drop in the wind, encouraged a trek up to the north end, but it wasn't long before the heavens opened once again. Nevertheless there were things to see with a juvenile Iceland Gull near the lighthouse new for the year. Similarities between the recent Bean Goose influx and that of 2011 are being realised, primarily due to the accompanying European White-fronted Geese which have started arriving too. 5 were seen today, with 3 of yesterday's Tundra Bean's also still present-it will be interesting to see if the numbers reach the level of a few years ago. The Canada Goose was also seen again, while 11 Whooper Swans, included a new family party of 4 at Garso. A couple of Hen Harriers were also logged along with 16 Fieldfares and 34 Snow Buntings, all at the north end. A strong easterly wind, touching gale force on the 22nd appears to have influenced a few arrivals. 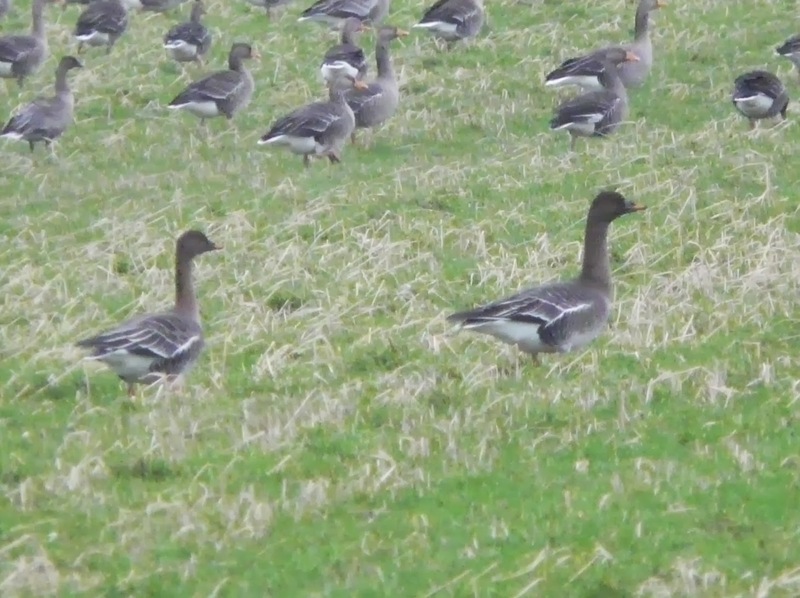 After a handful had been seen in Shetland the day before, it wasn't that surprising when 2 Tundra Bean Geese were found with the Greylags west of the Kirk on 21st. By 22nd at least 4 were present with 2 new singles (also Tundra) around the middle of the Island and what was thought to be the original pair on the west side. Along a similar theme, the Greenland White-fronted Goose and 4 Pink-footed Geese were seen again on the first date, while the Canada Goose and Green-winged Teal were seen on both. There was also some evidence of other new birds on 22nd with 4 Woodcocks and 6 Fieldfares along the sheltered western side. The weather has been pretty lousy over the last few days with the relentless south-easterly wind making walking difficult and often heavy periods of rain leaving the ground saturated. The 17th and 19th were spent drinking tea, ticking off a few maintenance jobs and working through the office paperwork. Highlights of the period were few and far between with the same juvenile Glaucous Gull at Bridesness on 20th and 27 Black-tailed Godwits still there on 18th. An adult Peregrine roamed the Island that day and presumably the same 4 Snow Buntings were seen on both dates. A wet an windy 15th got some paperwork out of the way, and once the rain had cleared through by mid-morning the following day a few hours were spent out and about in the sunshine. As is often the case after stormy conditions, large numbers of Gulls had gathered with at least 300 each of Great Black-backed and Herring Gulls present. Most were on the Links golf course although a juvenile Glaucous Gull was among a smaller flock near Stromness Point and an unseasonal Great Skua made a nuisance of itself off Bridesness. The drake Green-winged Teal was also there, along with 28 Black-tailed Godwits while a couple of Woodcocks were the first of the year. The 13th was a 'scorcher' by northern isles standards in January which even saw coats taken off for a while. 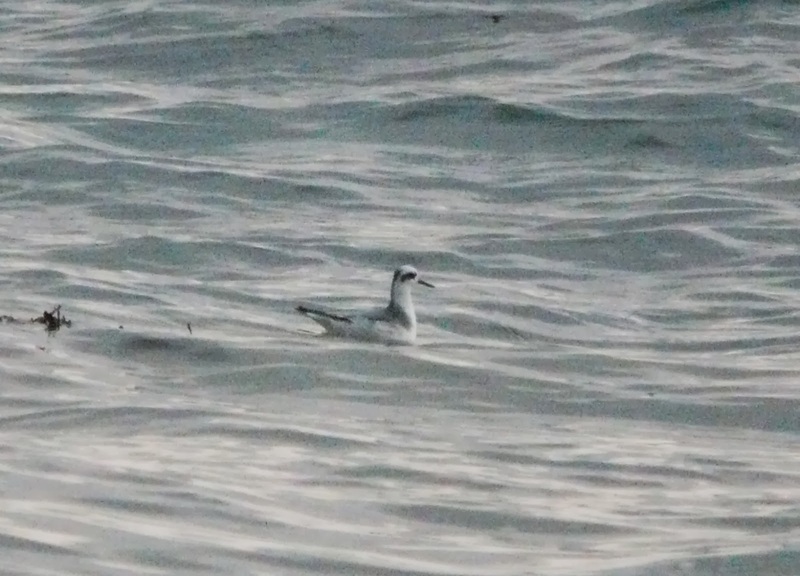 A Grey Phalarope just off the beach at Bridesness was a pleasant surprise with a/the Shelduck also there. The 14th was more normal with a cool south-easterly wind bringing heavy rain by mid-afternoon, the drake Green-winged Teal on Gretchen being the sole bird of any note. With settled weather there was little change on the bird front. The drake Green-winged Teal remains faithful to Gretchen Loch being seen on both dates and the only other sighting of note was the lingering Canada Goose, which made its first appearance of the year. The best weather of the year so far with no wind and just occasional light showers for a change. There was no sign of the Short-billed Dowitcher at the north end on 9th but it was tracked down to the links the next morning where it was the sole wader roosting among the feeding Wigeon and Teal on sandsheen-slightly odd but perhaps that's where its been hiding out? A pair of Shelducks were also there and the drake Green-winged Teal at Gretchen, with other notable wildfowl counts being 14 Pintails and 13 Goldeneyes in the north on 9th and 41 Long-tailed Ducks off the links on 10th. The calm seas there enabled 10 Red-throated Divers to be logged off the same section of coastline while the Buzzard remains in the Holland area and the first Peregrine of the year flew over. 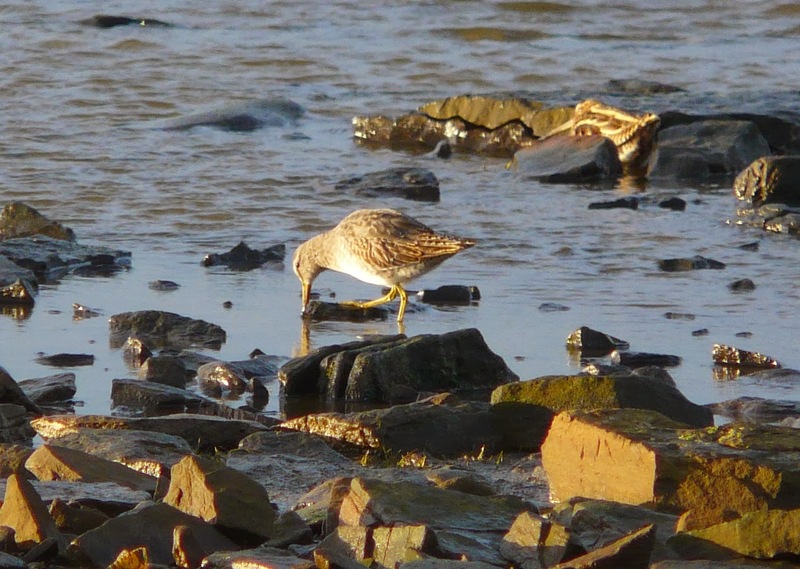 As expected the Short-billed Dowitcher duly made its debut appearance in 2014, having re-located back to the north end of the Island were it showed well at a number of sites in the Bewan area on 7th. Also left over from last year were the wintering Shelduck, Greenland White-fronted Goose and the Buzzard-the later two being seen on both dates. A couple each of Hen Harrier and Merlin made daily appearances while the Black-tailed Godwit flock continues to increase with 29 now at Bridesness. 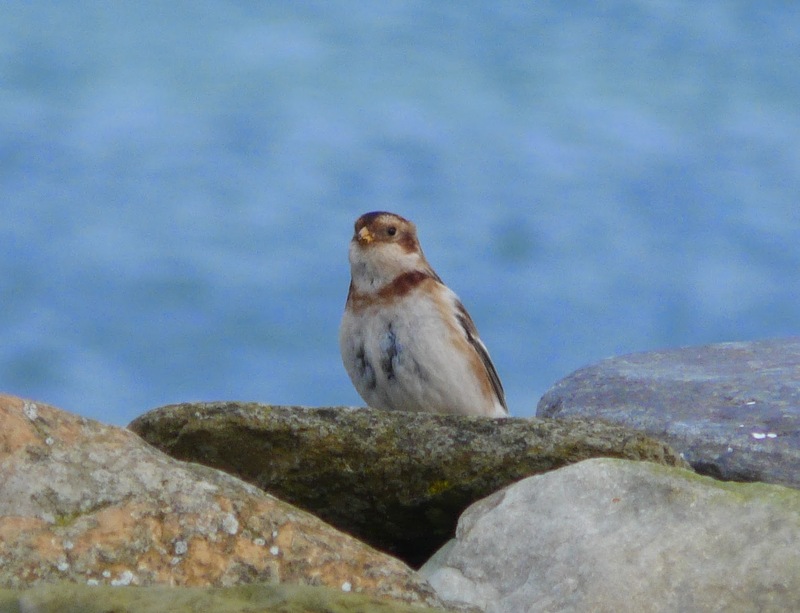 Passerine interest remains limited with 6 Fieldfares the pick of the Thrushes, 93 Twite and 6 Linnets at the Observatory on 8th when 31 Snow Buntings were counted around the south-east coastline. Things haven't really got going yet in 2014 bird wise with a few maintenance and paperwork issues taking priority the last few days. Highlights from 4th were a Little Auk which touched down briefly on Bewan Loch and the Black-tailed Godwit flock at Bridesness increased again to a new winter high of 26 birds. The Common Buzzard was seen again on 5th while after a very quite December for ringing a decent number of Twite have been caught and ringed at the Observatory's baited clap net site and 2 Jack Snipe have been processed from recent dazzling sessions. The first birding day of 2014 was definitely a windy one as yet another vicious Atlantic storm swept through the UK. The drake Green-winged Teal was the first of Decembers Nearctic trio to make it onto the New Years honours list, being seen in flooded fields near Kirbest where at least 120 Twite were still nearby. Numbers of large Gulls had also gathered in a few places, with a second-winter Glaucous Gull picked out among 110 Herring and 85 Great-black backed Gulls on Torness.